When they’re substantial (we’re talking 50% or more) and last a short time (a few days or less), coupons have a proven record of increasing sales – and not only by a little. 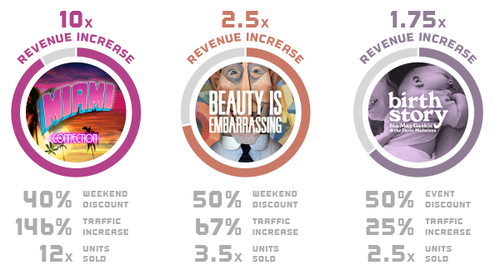 On average, offering steep, short-term, “flash sale”-style discounts on Vimeo OTT resulted in 4x higher conversion rates and 6x more sales week-over-week. Remember to share coupons with your social media audiences: i.e. Twitter, Facebook, Google+, LiveJournal. Is your movie being mentioned on reddit or The Pirate Bay? Chime in and share a “TPB” coupon for 50% off. Is a blog or publication writing about your movie? Make them a “MAGAZINENAME” coupon - it will make the purchase feel even more special. Awareness is key! Discover the power of the coupon, then go buy something pretty for yourself. You've earned it.